Architect of the Capitol's R.C. "Skip" Vaughn, Capital Projects Administrator, gives a quick project update from the building utilities phase of the Cannon Renewal. As part of the Cannon Renewal Project, the team is using ground penetrating radar (GPR) to plan and execute its work. GPR drawings (like the above) help workers see what's inside the concrete of the Cannon Building's garage and moat walls. The project team's structural engineers are then able to identify exactly what a worker may potentially hit behind that area of concrete and determine the best way to relocate holes and minimize their impacts. The project team is able to use the GPR drawings to precisely locate existing reinforcing steel and utilities, avoiding potentially costly and time-consuming corrective measures from drilling through these types of items unknowingly. This practice, along with the use of fully coordinated 3D building information model drawings, helps to ensure we minimize the amount of historic fabric disturbed while installing the new utility systems for the Cannon Building. 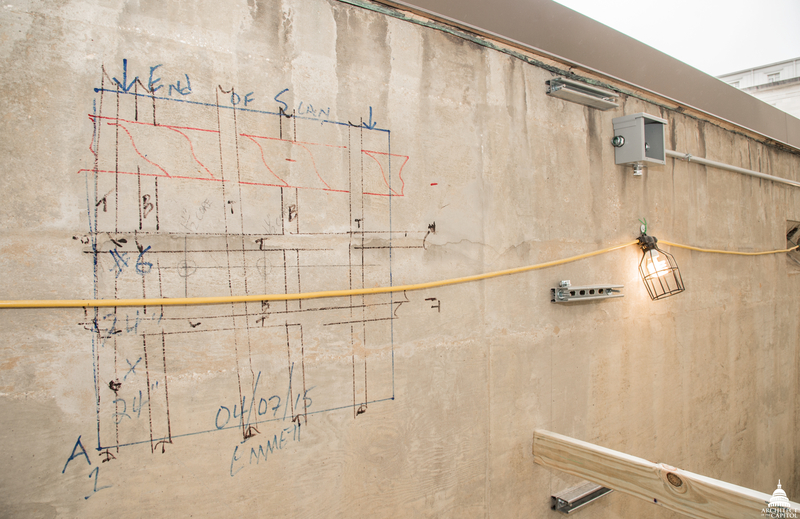 A GPR drawing on a concrete wall in the Cannon Building's courtyard.